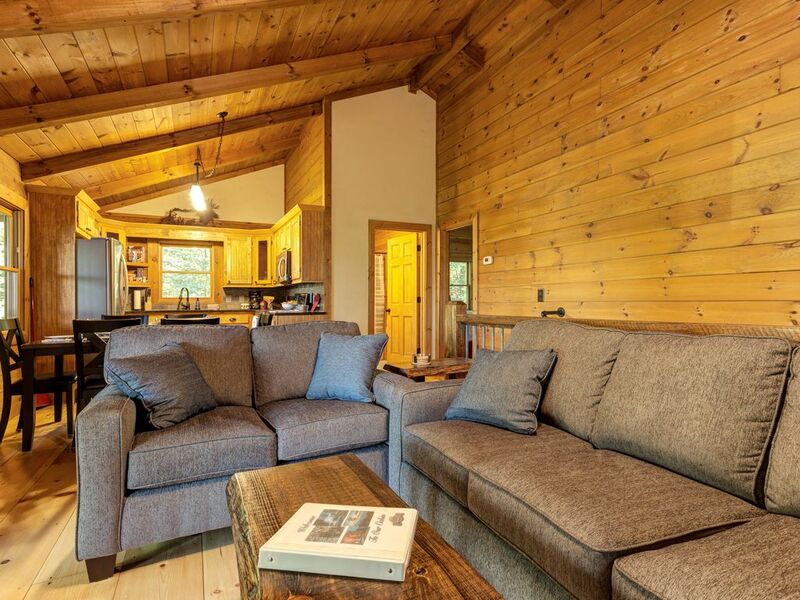 Surround yourself with rich, knotty pine inside and lush green forests outside at this beautiful, recently-renovated cabin. Enjoy the well-stocked game room/lounge, the furnished, wraparound deck, and the private hot tub, all located within a couple miles of downtown Blue Ridge. Find yourself close to several hiking trails within national wilderness areas all ripe for exploration. Take a drive over to the shore of Blue Ridge Lake for watersports, fishing, swimming, and picnicking, just seven miles east. Or spend a little time in Blue Ridge for one-of-a-kind shops, brewpubs, restaurants, and local attractions, just three miles from your front door. Perfect for a large family or a few couples traveling together, this updated home offers a number of options for home entertainment including free WiFi, multiple cable TVs, and a game room/lounge featuring a foosball table, dartboard, board games, a videogame console, books, and a bar area. Kick back on a rocking chair out on your porch or watch the sun rise or set over the mountaintop while you have a soak in your private hot tub. Reserve this secluded Blue Ridge getaway today and welcome to your mountain home away from home! Easy to find. Great cabin and location and hot tub. Gas grill, fire urn and porches were great. Upstairs bedrooms very nice. Netflix in living room! Central to everything! Downstairs very cold, and the violently squeaky mattress was ridiculous. Hard to sleep. And no Netflix downstairs. We stayed over the weekend with a few friends. The house was updated - great bathrooms- and super clean. The porch was great for watching the wildlife, and we all enjoyed access to the hot tub. Our 5-year-old loved the foosball table. We will definitely be back! Beautiful cabin and fantastic location. Great weekend getaway! We had a very nice weekend. We loved the house, game room and hot tub! In love with this cabin! and very near to the town! definitely coming back!